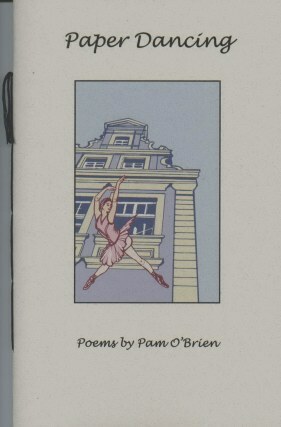 Pam O'Brien began writing poetry while at Allegheny College. She has worked in government planning, grantwriting, advertising/public relations, and publishing in addition to teaching college English and elementary school Spanish. O'Brien holds a Visiting Lectureship at the University of Pittsburgh where she serves as the Associate Director of Public and Professional Writing and teaches a variety of composition courses. Her first chapbook, Kaleidoscopes, was published in 1999. She is a member of the Squirrel Hill Poetry Workshop. And you want legs, too. or of drowning in that long water. So you strike a deal with the sea witch. She takes your voice and delivers the handsome prince. from the other side of words. Paper Dancing is a 32 page hand-sewn chapbook. To order through mail send total price plus $1.25 Shipping and Handling ($1.75 in Canada; $3.25 other countries) for each address sent to.